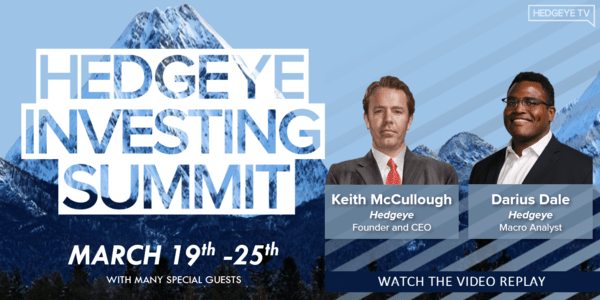 Below are key takeaways transcribed from CEO Keith McCullough and Senior Macro analyst Darius Dale’s in-depth discussion during our 4-day Hedgeye Investing Summit. As you may already know, we’ve been warning about worrisome U.S. economic trends. These trends have important implications for your asset allocation and the market over the next six months. CLICK HERE to watch the entire presentation. Darius Dale: Good afternoon everyone. This is Darius Dale, Senior Macro analyst on the Hedgeye macro team. I'm joined in the studio by Hedgeye CEO Keith McCullough. He and I will discuss what we believe to be unmistakable signs of a U.S. economic slowdown which obviously the Fed now agrees with – otherwise they wouldn’t have pivoted dovish three times in the last three times in the last three months. Keith McCullough: Yes, we've spent a lot of time in last three days just going through a lot of the causal factors. There's so much that you need to do to even start playing this game at a high level. We're not God's gift to the game, but we're certainly ready, willing and going to help you play this game at the highest level you possibly can. But first I want to surgically get into that process. We have conviction in our view that the U.S. economy is slowing. The Fed now agrees with us, or has a central tendency to agree with us, on a three to six month lag. We're not constantly fighting the Fed but trying to front run them, which is a much better place to be when you're when you're when you're trying to make and save some money. 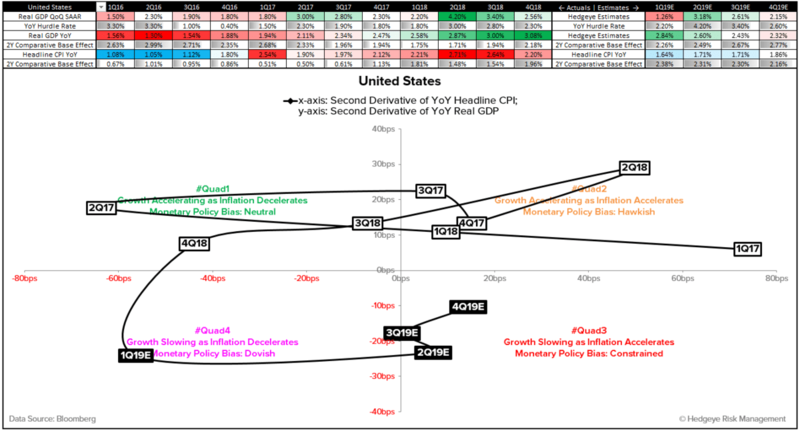 For those of you that don't know our four quadrant measuring and mapping processes, it's called our GIP model (Growth, Inflation and Policy). Here we’re essentially using predictive tracking algorithms to come up with forecasts for Growth and Inflation to get you ahead of the Fed (that’s the “P” in GIP) because those are the two most causal factors when predicting future asset class outperformance and underperformance. We also have proprietary and quantitative-based Risk Ranges that we track for all publicly-traded assets. These are generated via the asset in question’s underlying price, volume and volatility. These Risk Ranges are trying to get you ahead of breakouts and breakdowns based on the market trends in that asset. With these two risk management tools we’re effectively trying to A/B test what the market is saying (with our Risk Ranges) against what our forward-looking outlook is for the U.S. economy (our GIP model) to find the most probable outperforming sectors, style factors and asset classes. So again we have our four quadrant GIP model setup. You have two factors, growth and inflation. Based on the year-over-year rate of change in both of those factors changes which quadrant you’re in. When Growth is accelerating and Inflation is slowing that’s Quad 1. When Growth and Inflation are accelerating at the same time that’s Quad 2. Easy enough, one has more inflation. One has less. The U.S. economy has been in either Quad 1 or Quad 2 for the last 10 straight quarters. That’s a record run for the consecutiveness of U.S. growth accelerating. 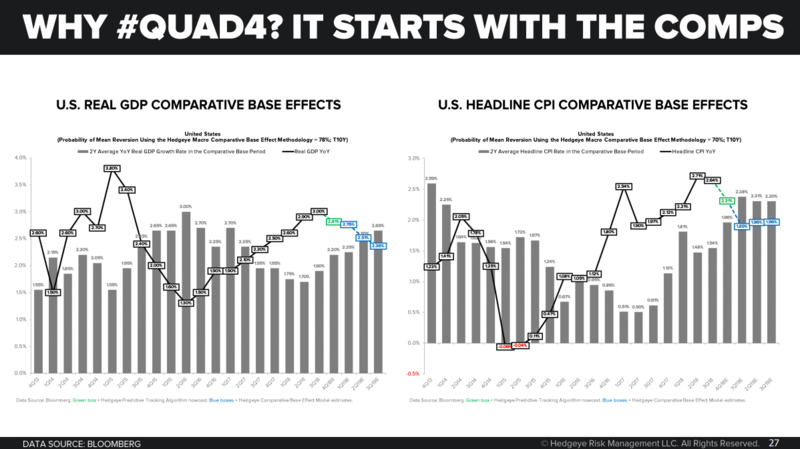 Now, when most U.S. economic data starts to slow like it did in the fourth quarter you end up in Quad 4. That’s when both the rates of change in Growth and Inflation slow at the same time. When this happened, the Fed freaks out, because asset prices really don't like this environment. Once the Fed sees Quad 4, it tries to push markets into Quad 3, an environment of Growth slowing and Inflation accelerating. What market history tells us is the reaction of market participants when the Fed goes dovish is the bidding up of commodity markets and asset markets. What the Fed is trying to do is get people to believe that asset prices can't go down, even though the economy is still slowing. This environment is called stagflation or a stagnating U.S. economy. You want to be surgical about the specific sector pivots you make in each of these Quadrants. Our process is not only predictable and rules-based, but it's repeatable. Quad 4 is the death knell. Remember, into the fourth quarter, we were coming out of a record two and a half years of U.S. growth accelerating. In those Quad 1 and 2 environments, your top three longs from US style factor perspective are Momentum, Growth and High Beta stocks. The sectors you wanted to be long were Tech and Consumer Discretionary. But then whammo! Quad 4 hits. Now those sectors and style factors are the things that you want to be short: Tech, Energy and Industrials, Momentum, High beta and Growth. So this is the call that we made on September 27th that after two and a half years of being in a U.S. growth accelerating environment the U.S. economy was about to slow. You wanted to get out of all those things you owned for two and a half year and start buying things like long-term Treasury bonds, Gold and the sectors that are bond proxies which include Consumer Staples, REITs and Utilities. To sum up, the Fed saw the first signs of U.S. growth slowing and the impact on asset markets and said ‘OK we've got to pivot.’ They went triple dovish – from hawkish to dovish in December; then dovish to more dovish when Powell said the Fed was “on pause”; and dovish to what we called “dovish enough” last week when they lowered their economic outlook. What happens? Treasury bonds go up and Treasury yields are going down. All the Quad 3 exposures that we like including Utilities, REITs and Energy go straight up. McCullough: Darius, can you get into the dynamics of our base effects model? Dale: Sure, I’ll back off and explain some context first. The U.S. economy is coming off a record 10 quarter acceleration in real GDP growth. You can pull the data all the way back to as far as you can get and we've never seen such a continuous run of improving economic conditions in the U.S. That’s fine and dandy and perpetuated the all-time highs in risk assets in the late summer but now that’s your comparative base. So as we progress throughout 2019, what we’re likely to see are nascent signs of deceleration off the cycle peak. The probability is rising that we continue to slow through the back half of the year as the comparative base gets tougher and tougher and tougher. The model back-tests quite well with a 73% probability that growth slows in these forecast periods when the base facts steepen. Similarly, growth tends to accelerate as base effects are receding by the same degree in magnitude. McCullough: These are the base effects in the gray bars. Think of it like a mountain. If you're at the base of a mountain you're at fifteen hundred feet then you go up to 15,000 feet your pace is probably going to slow down. The whole concept of base effects is that the mountain is getting steeper. 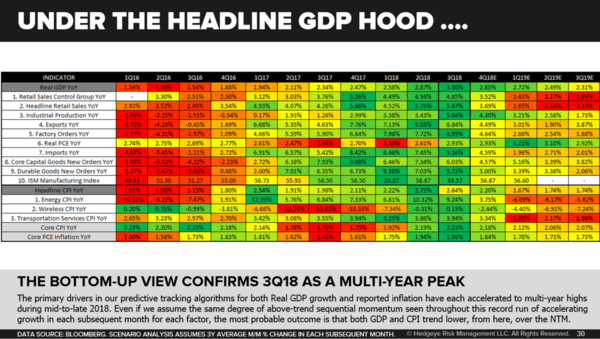 That’s why Hedgeye is as bearish on the growth cycle today as bullish as we were back when U.S. growth was accelerating. Dale: So we run a predictive tracking algorithm for not only the U.S. economy but for every economy investable economy that has a series of high frequency indicators with respect to consumption and manufacturing data. What we do is combine all those into a proprietary Nowcasting formula to determine what the output for GDP or for CPI likely to be. What Keith is highlighting here are the top 10 factors in the Nowcasting model. Each of these factors decelerated off their respective cycle peak which was largely 3Q18. It was easy for us to pick up on this deceleration in real time which was confirming of our initial forecast that growth would decelerate as a function of base effects starting to steepen. CLICK HERE to watch the entire 51-minute presentation.